Indulge in the elegant beauty of Chocolate by Petite Le Vian. 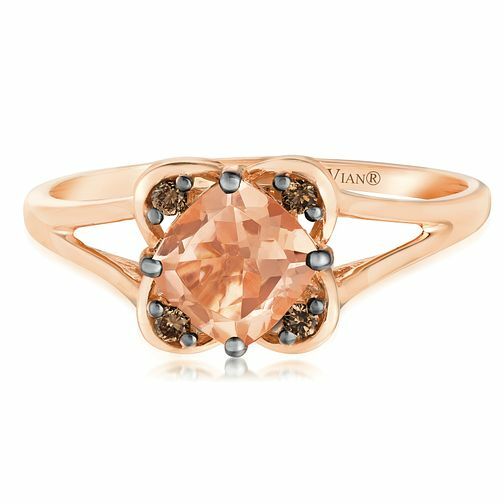 With an angled square Peach Morganite at its centre, this stunning ring is crafted from sumptuous 14ct Strawberry Gold and features a floral inspired design set with deliciously dazzling Chocolate Diamonds around the Morganite stone for breathtaking beauty and unique, glamorous style. 14ct Strawberry Gold Peach Morganite & Diamond Ring is rated 5.0 out of 5 by 1. Rated 5 out of 5 by Anonymous from Stunning I would not normally buy an expensive piece of jewellery like this online, however, when I collected this ring from the local store I was delighted to see that it was a stunningly beautiful piece in a gorgeous box. Luckily for me I had managed to work out the correct size to order and it fitted perfectly. Very, very happy. Thanks H. Samuel.